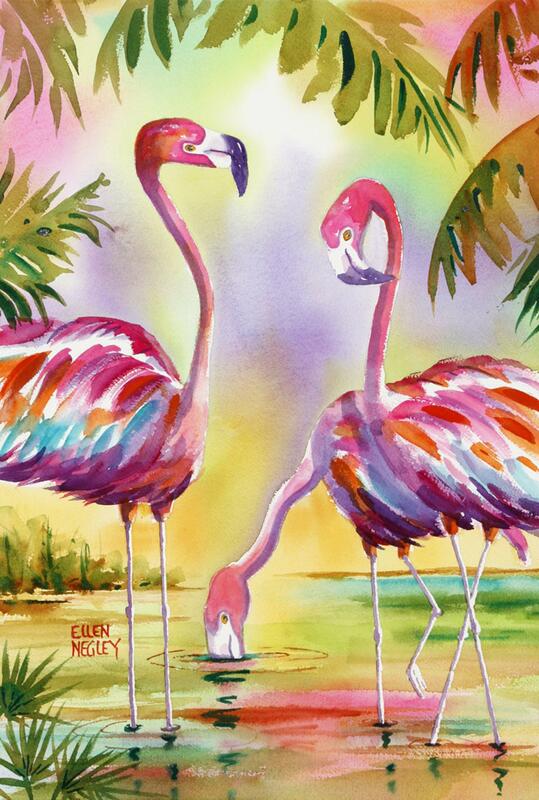 This is an original watercolor of Flamingos in a tropical setting. The size is 15 x 22. Painting will be mailed in a flat box ready for you to add framing. Flamingos have to be one of the most unique creatures Mother Nature ever created. They are truly weird and wonderful. I really enjoyed painting FLAMINGO FAMILY II mainly because it gave me the opportunity to explore such fun, tropical colors. I especially like the color pink so what better place to add an extra heaping of pink but on FLAMINGOS! The finished painting reminds me of those old Florida postcards with that retro look. If you are looking for originals paintings but don't find what you're looking for, feel free to send me a message. I often have more than what's here. Just let me know what you're interested in.